Menstrual disorders are changes in normal menstruation. Menstruation is one part of the cycle in which a woman's body gets ready for pregnancy each month. A cycle is counted from the first day of bleeding to the first day of the next period. An average cycle is 28 days, but 21-35 days is also common. At the start of the cycle, the hormones estrogen and progesterone are low. As the cycle continues, estrogen starts to rise. This makes the lining of the womb grow and thicken. An egg in one of the ovaries also starts to mature. It is in a follicle sac that makes estrogen as the egg grows. At about day 14 of a 28-day cycle, the sac bursts and the egg leaves the ovary. It stays near the opening of the fallopian tube until it is fertilized by a male sperm. If this happens, it travels through one of the tubes to the womb. 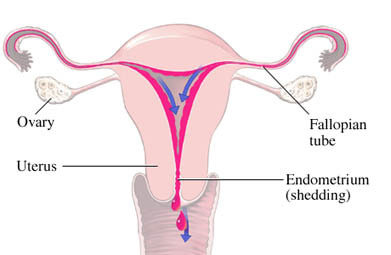 Ovulation is when the egg leaves the ovary. After the egg leaves, the sac (now called the corpus luteum) stays in the ovary. It keeps making hormones, mainly progesterone. The rising levels of estrogen and progesterone help build up the lining of the womb to get ready for pregnancy. The few days before, during, and after ovulation is the time when a woman can become pregnant. Because the length of cycles varies, it may happen earlier or later than day 14. The sac keeps making hormones only for 14 days, unless the egg is fertilized by sperm. The fertilized egg becomes an embryo, passes down the fallopian tube, and attaches to the lining of the womb. The growing pregnancy releases a hormone (hCG), which stimulates the corpus luteum. It makes all the progesterone needed to keep the egg implanted and growing until a placenta (an organ connecting the fetus to the mother) forms. The placenta then makes hormones and gives nourishment from the mother to the growing embryo. If an egg is not fertilized, the corpus luteum stops making hormones and gets reabsorbed in the ovary. Estrogen and progesterone levels drop again, the lining of the womb breaks down, bleeding starts, and the cycle starts again. This cycle will happen each month starting from about age 12 years old to an average age of 51 years old. This is when menopause signals the end of these cycles and being able to become pregnant. Most women lose about two ounces (60 milliliters [mL]) of blood or less. In some women, bleeding can be heavier and last longer. This is called menorrhagia. This happens with more than 2.70 ounces (80 mL) of blood loss or periods that last more than seven days. This can be caused by a number of reasons. It can lead to anemia and other health problems. The absence of menstruation can be primary or secondary. Primary amenorrhea is when a girl does not start to menstruate within the normal time frame of sexual development. Primary amenorrhea is diagnosed if there is no menses by age 14 without growth or development of secondary sexual characteristics; or if there is no menses by age 16 whether or not there is normal growth and development with the appearance of secondary sexual characteristics. Secondary amenorrhea is when periods are absent for at least three cycles (for reasons other than menopause). When estrogen is low, amenorrhea can lead to a decrease in bone density and an higher risk of osteoporosis . Light bleeding in between periods can have many causes. It can be from a hormonal imbalance (causing lack of ovulation), medicines (birth control pill), infections, growths on the cervix or womb, or miscarriage. When a woman loses greater than 2.70 ounces (80 mL) of blood during menses and also bleeds irregularly in between periods, it is called menometrorrhagia. This can be from a number of causes, such as hormone imbalances. Female athletes often have light periods and fewer periods due to the hormonal changes from too much exercise and low body mass. Anorexia and other health problems may also be associated with hypomenorrhea, oligomenorrhea (too few menses), or amenorrhea. In a normal ovulatory cycle, ovulation occurs. The cycle is regular whether it is the usual 28-day cycle (ovulation on day 14); or, say, a 35-day cycle (ovulation on day 21). When ovulation does not happen, the corpus luteum is not able to make the hormones (for 14 days) that get the womb ready and stop it from shedding. Menstrual flow can happen at any time. This in-depth report focuses on menorrhagia and amenorrhea. What are the risk factors for menstrual disorders?What are the symptoms of menstrual disorders?How are menstrual disorders diagnosed?What are the treatments for menstrual disorders?Are there screening tests for menstrual disorders?How can I reduce my risk of menstrual disorders?What questions should I ask my doctor?What is it like to live with a menstrual disorder?Where can I get more information about menstrual disorders?